This Saturday 27th October 2012 will see the running of the annual Silver City Cup. This is the 'other' horse race meeting on Broken Hill's annual racing calendar. The main racing event being the famous the St. Patrick's Day race meeting held in March on or around the 17th. The venue is the Broken Hill Regional Events Centre - Racecourse Road, Broken Hill. The Silver City Cup race meeting, which was first run in 1899, is considered more of a family day with lots of things to do for children. There will be 5 or 6 races depending on acceptances. The race is once a year timed to coincide with the prestigous Group 1, 2040m Sportingbet Cox Plate which is run at Moonee Valley in Melbourne at 5.15pm Melbourne time = 4.45pm Broken Hill time. The Silver City Cup, Race 6, is a 1600m race which is run at 5.00pm local time = 5.30pm Melbourne time. 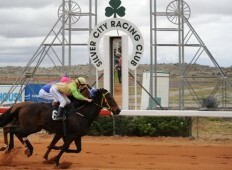 The 2011 Silver City Cup was won by Cobar trainer Allan Prisk's Turn Him Loose. Lester Grace was the jockey and this was his first ever win. There will be a record prize money of $50,000 and $1,400 in trophies. There will be bookmakers and a TAB on the course which will be taking bets on both local and interstate racing. Racing NSW has more information and a copy of the racebook/formguide can be found here. There will be the 2012 Atlas Copco Fashions on the Field event as well as national TV stars Dan Ewing and Rhiannon Fish from the Australian TV show 'Home and Away' attending as special guests. Dan and Rhiannon will be involved in judging the fashions on the field. The categories are - Most Elegant Silver City Lady, The Trendiest Chick, Country Casual Male and Best Dressed Girl and Boy. For more information from the Silver City Racing Club please see here. It should be a wonderful day, and I know I keep saying it but I wish I could be there. It was so close this time as I visited the city last weekend for a few days and had a fantastic time, but I do have a day job and needed to be back in Melbourne for that. Whilst I was visiting Broken Hill this trip, the famous Nanua races were on. They're held 140kms south west of Broken Hill. It is a whole two day carnival on a private property. Unfortunately I didn't have time to get to that meeting either, but now that I know it's on I'll add it to the list of things to do in the future.